Sorry... the 2017 Nissan Versa Note is no longer being sold as new. Instead, take the first step to a great deal on 2018 Nissan Versa Note with a free price quote! 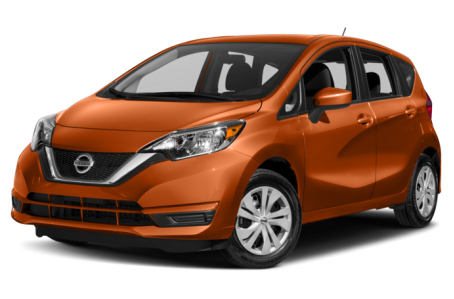 The 2017 Nissan Versa Note is the 5-door hatchback version of the Versa subcompact. It competes with the Ford Fiesta, Honda Fit, and Chevrolet Spark. The Versa Note receives a new, revised front-end that features the bold “V-Motion” grille found on other Nissan models in the lineup. The narrower, longer slits at the lower fascia also give the Versa Note a sleeker, more current appearance. Standard features include active grille shutters and 15-inch steel wheels. Smoked headlights, fog lights, power/heated side mirrors with turn-signal indicators, a rear spoiler, and larger 16-inch aluminum-alloy wheels are available as well. Under the hood, the Versa Note is powered by a standard 109-hp, 1.6-liter 4-cylinder engine mated to a standard Xtronic continuously variable automatic transmission (CVT). Fuel economy for the Versa Note is an EPA-estimated 31/39 mpg city/highway. Inside, the Versa Note has a standard cloth interior with a 60/40-split folding rear seat. It has 21.4 cubic feet of cargo space with the rear seat folded down. The center stack features a standard audio system with CD/MP3 playback. It can be upgraded to the NissanConnect multimedia system that includes a 5.8-inch touchscreen, an integrated navigation system, Bluetooth connectivity for phone and audio, voice command recognition, and a USB port. Standard features include air conditioning, front and rear cup holders, and a tilt steering wheel. Power windows/locks, cruise control, a leather-wrapped steering wheel, remote keyless entry, and push-button start are also available. Lastly, the Versa Note has an optional Divide-N-Hide Adjustable Floor at the rear cargo area that allows you to stow away more stuff underneath. Standard safety features include front air bags, antilock brakes, and an electronic stability system. An optional Around View monitor shows a top down view of the car making parking or slow maneuvers in tight spaces breeze. The cameras also offer a backup view with gridlines, or a curb view for parallel parking. The Versa Note also includes one of our favorite features, a smart tire inflate system that honks the horn when the tires reach the correct pressure – no more fumbling with tire pressure indicators, no more stress.